Leadership Team Alignment enables teams of all types, at every level of the organization, to rapidly accelerate performance, deliver consistently higher business results, and work together as unified, self-directed entities. Our alignment process begins with the senior team and cascades through “multi-tier” alignments at succeeding levels. Employing a process that combines a unique blend of consulting and facilitation we work to create horizontal teams that are strategically and operationally in sync, are clear about goals and accountabilities, share common ground rules for resolving issues, and work together transparently. 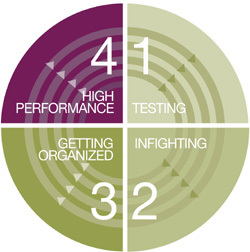 At any point in time, a team occupies one of four stages, ranging from Stage 1, where team members are wary of one another and fear confronting issues head-on, to Stage 4, where a team’s mission and goals are clear, there is a shared sense of ownership and accountability, and there is comfort dealing with conflict. Stage 4 teams work horizontally and are the ultimate engines for high performance. Ultimately, the senior management team will become the model of high performance for the rest of the organization. It is the essential first step in creating a horizontal, high-performance organization. Unless a team has undertaken a serious effort to transform itself—and doing so involves leadership team alignment supported by leadership coaching and leadership development—it will not achieve Stage 4 high performance. Helping teams reach the level of performance has been a hallmark accomplishment of Guttman Development Strategies. Leadership Team Alignments deal with live issues and focus on redefining what it means to lead and be a player in a horizontal setting driven by a high-performance culture. At the end of the initial alignment session, a team knows exactly which key issues it needs to resolve and is united by tangible agreements for moving forward. Members have a clear picture of the changes they must make, both as individuals and as team members accountable not only for their own performance, but for the leader’s and, ultimately, that of the entire team. With the foundation for high performance in place and guided by an integrated process of leadership development, coaching, and reassessment, the team moves to playing at significantly higher levels. When Catherine Burzik became president of Applied Biosystems (AB), she knew she faced stiff challenges. The company she was about to lead had been stagnant for several years, with little revenue growth and falling stock prices. When Brian Camastral took over Mars, Inc.’s Latin American Division in 2005, the 3,000-associate operation had been consistently underperforming. The region was comprised of four business units: Two were losing money, one was declining, and the fourth was growing incrementally.